Wacom just revealed the new Cintiq Companion family of tablets, which consists of only two models: the Wacom Cintiq Companion and the Wacom Cintiq Companion Hybrid. Both use a Full HD 13.3-inch TFT LCD touchscreen display and come alongside the Pro Pen with 2,048 pressure levels and adjustable stand, but there are also plenty of differences to talk about. 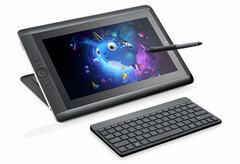 Additional features of all Wacom Cintiq Companion tablets include the customizable on-screen controls, Rocker Ring, ExpressKeys and Radial Menu. While the entire family of tablets is already available for pre-order, the Tegra 4 powered units will arrive first, in less than a month. The more expensive Cintiq Companion models are expected to show up in October. For more details, please see the press release below. VANCOUVER, Wash., Aug.19, 2013 /PRNewswire/ -- Staying on top of evolving trends in the creative community and responding to frequent requests from professional customers, Wacom® extends the creative experience from the desktop to a mobile environment with the new Cintiq® Companion line of creative tablets. Nowadays, creative professionals require high performance hardware and software that enable them to create in a variety of environments including studios, client offices, coffee shops, planes, trains and many more. The Cintiq Companion supports creative freedom by offering everything necessary for productive art and design work whether in the studio or on the go. Providing an all-purpose, mobile workstation, it is a fully-fledged Windows 8 tablet, powered by a 3rd generation Intel® Core™ processor and Intel® HD Graphics 4000 that pack a punch whether designing a character, or retouching a photo. For excellent creative results, Wacom offers two models. One with 8GB memory and 256GB SSD with Windows 8 and the other with 8GB memory, 512GB SSD with Windows 8 Pro. For illustrators and designers who want to draw, sketch and paint when mobile, but who also want to use their professional software when connected to a Mac or PC, the Cintiq Companion Hybrid offers a 'two-in-one' solution. The Cintiq Companion Hybrid functions as a traditional Cintiq when connected to a Mac or PC. When unplugged, it is perfect for light, spontaneous work using Android™ apps. The tablet comes with a powerful Nvidia® Tegra® 4 processor, Android Jellybean and specially designed software such as the new Wacom Creative Canvas for painting and sketching. For further refinement when back in the studio, rough images can be easily transferred to a computer or shared directly to popular cloud services with the easy and pre-loaded ASTRO File Manager™. Two versions of the Cintiq Companion Hybrid are available, a 16GB version and a 32GB version. The Cintiq Companion Hybrid models are priced at $1499 (USD) for the 16GB and $1599 (USD) for the 32GB. Both products will be available from Wacom's eStore in mid-September. The Cintiq Companion models are offered at $1999 (USD) for the Windows 8 with 256GB SSD and $2499 (USD) for the Windows 8 Pro with 512GB SSD. The Cintiq Companion models are scheduled to appear at the Wacom eStore in October. Wacom's vision to bring people and technology closer together through natural interface technologies has made it the world's leading manufacturer of pen tablets, interactive pen displays and other digital interface solutions. The advanced technology of Wacom's intuitive input devices has been used to create some of the most exciting digital art, films, special effects, fashions and designs around the world. Wacom devices provide business and home users with the ability to explore digital content in a comfortable and natural way.